This post is now outdated. Please click here for current viewing information. C/2014 Q2 Lovejoy is fading very slowly, though hard to see with binoculars in the moonlight, marching north at almost 1° per day. The comet is currently in Andromeda close to 2nd-magnitude double star Almach and highest in the sky to the south at 6 pm from the British Isles. Look below for detailed B/W charts suitable for printing. AN Graphic by Greg Smye-Rumsby. Until recently, Northern Hemisphere comet watchers have enjoyed viewing Comet Lovejoy riding high in a dark sky, but with a Moon a day after full, lunar glow is a problem. Nevertheless, the comet’s easily found in small telescopes. The fifth comet discovery of Australian amateur astronomer Terry Lovejoy on 17th August 2014, it quickly became apparent that this was a long-period comet with a high orbital inclination of 80°, but this isn’t its first visit to the Sun. Observers with binoculars and portable telescopes should seek out a dark, safe location with an unobstructed view of the southern sky — preferably with the Moon hidden behind a wall or building. 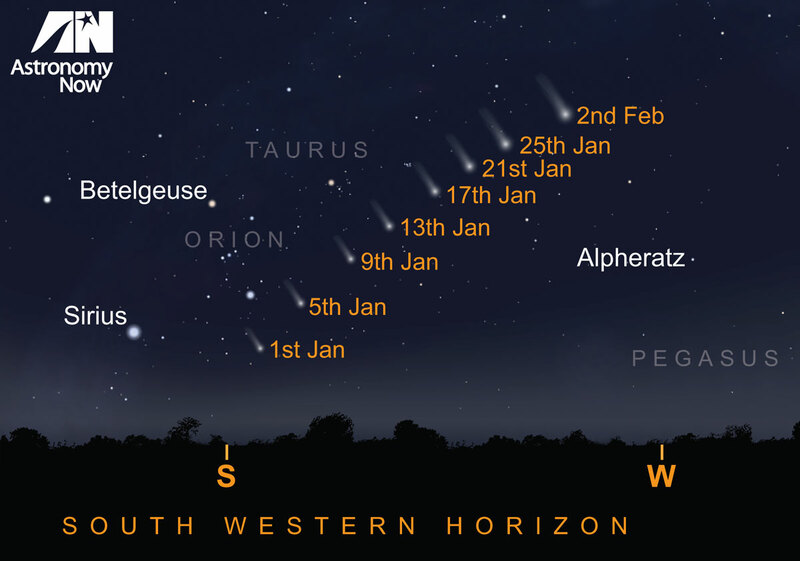 The best time to observe in the UK is 7 pm GMT when the comet will be highest above the horizon at the time twilight ends. 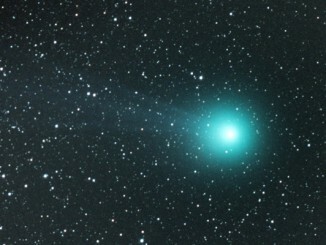 With the glow of a Moon one day after full, Comet Lovejoy is only visible in binoculars or telescopes. Use the lowest power eyepiece you have when observing with a telescope. C/2014 Q2 lies in a star-studded field just ¾° west of beautiful 2nd-magnitude double star γ Andromedae (otherwise known as Almach) tonight. The star and comet will be in the same field of view using instruments at 50x magnification or less. 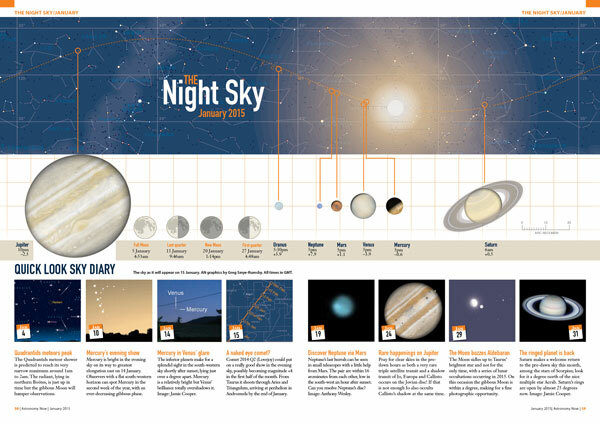 Find out more about what’s up in the night sky in the January edition of Astronomy Now. Never miss an issue by subscribing to the UK’s biggest astronomy magazine. Also available for iPad/iPhone and Android devices. Comet Lovejoy has been a easy to follow object since the beginning of the year. Throughout May the comet continues its trek towards the north celestial pole, culminating in a close conjunction with Polaris at the end of the month. Now that the Moon has returned to evening skies, observers have to wait a little longer to view Comet Lovejoy in a dark sky. Fortunately, it’s a circumpolar object for observers in the British Isles, near the familiar W-shaped constellation asterism of Cassiopeia during March. Comet Lovejoy continues its northerly trek through Cassiopeia, en route to a close encounter with Polaris on May 27th. A circumpolar object of the high north, the comet never sets as seen from the British Isles this month — what’s more, it’s brighter than predicted.